I started in financial markets in May 2012. I was first trading spot shares. I was lately trading currencies, DAX and oil. FOREIGN EXCHANGE Trading: I find it exciting because of its liquidity and because it involves contact with events happening around the world, beyond local events. The charts reflect something that’s going on. Get oriented with TRAINING as soon as possible, to save time. 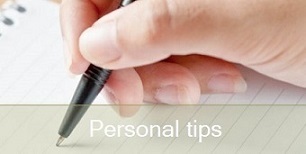 ‘I have followed courses with recognized experts who helped me to operate with a working method. I had experience as psychologist, sportsman and programmer analyst. This last discipline has come in handy for developing algorithmic systems’ (ChMir). Above all CONSTANTITY, which only comes if there is a real AFFECTION. ‘To maintain the effort it is necessary that you like the world of markets, something that does not happen to all traders’ (Brett Steenbarger). To propose OBJECTIVES that are close and that adapt to oneself. ‘If trading is not an ideal way for you to develop as a person, then you will be better off looking for your passion elsewhere’ (Brett Steenbarger). Bet on a proven STRATEGY. ‘Investigate strategies, test and apply them systematically with absolute rigour. That is the difference between the impulsive and the systematic operator’ (Boris Schlossberg). ‘If there is a position that is making us feel bad, the solution is very simple: Close it. There will be time later to re-enter’ (Paul Tudor Jones). ‘It is a good system to add winners and split the tickets’ (ChMir). Accept positive and negative RESULTS. The positives are like the sales of the business, the negatives are the costs. ‘End the search for the Holy Grail and the search for a system that never loses. Instead, learn to live with the inevitable losses’ (Rob Booker). Compared to other good brokers, DARWINEX allows you to stop trading ‘peanuts’. Can I help you to invest? The aim is to obtain consistent returns, with an adjusted level of risk that allows the system to reduce the loser series as much as possible. 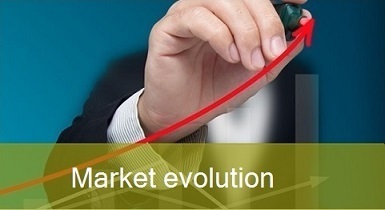 The main objective of the system, like any other, is not to lose by following several guidelines: Entry technique with statistical advantage, conservative risk management applying the strategy and developing competencies and new skills. The exchange rate is always given for a currency pair. A currency by itself is worthless if it is not compared to another currency or other reference, such as gold. Therefore, whether in a flexible exchange rate or fixed exchange rate system, one always speaks of RELATIVE VALUE. If a currency is very attractive to foreign investors and speculators, with high demand and attractive interest rates in a stable socio-political environment, it can be said that its value should go up. Now, if we face another even more attractive currency, the exchange rate between the two should go the other way. The RELATIVE FORCE of the currencies is obtained by analyzing 23 pairs formed by the 8 most liquid currencies. The current ADX value is also obtained. This information is decisive for an entry confirmation. Lastly, an EXPONENTIAL MEDIA that confirms the trend is taken into account. 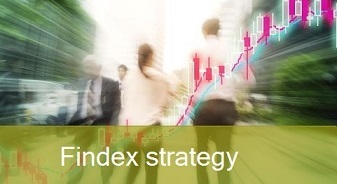 ADX Average Directional Index: Designed by Welles Wilder, the ADX measures the strength of the trend without looking in the direction of the trend. It measures the momentum of a value. Generally a solid trend will be about ADX value 25, whereas it is considered that there will be no trend if the value is below 20. 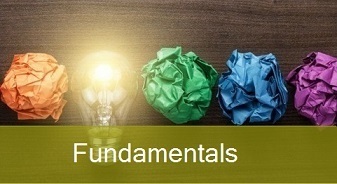 MOMENT: It is essential for the strategy used to adapt to market conditions. 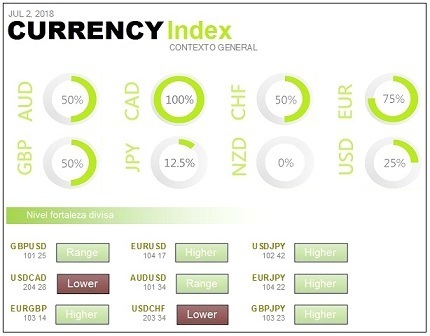 Operations are always opened at the same time, if the input signal is given, based on the previous optimization performed with each currency pair. REFERENCE: In 1-hour charts, they serve to delimit the relative strength of currencies and trends. Here it is verified the level of ADX that will serve as the final trigger for the opening of operations. It also detects which pairs are suitable for operating in the day. MARKET EXPOSURE: The trades are open in 5-minute charts. All adjustments, and detection of new operations, occur at the start of each new candle. The targets are very close to avoid high exposure to the market, both in terms of time and size of operations. They are located between 12 and 30 pips, depending on the optimization process. ON AND OFF DEPENDING ON THE FILTERS: The robots used are turned on and off at will, depending on the objectives achieved, the appearance of relevant news, weekends, etc. Automatic entry operations can be blocked if the context, at a technical or fundamental level, is very unfavourable. There is a strong tendency and entry in favour of the trend. There is an exhausted tendency and entry against the previous trend. 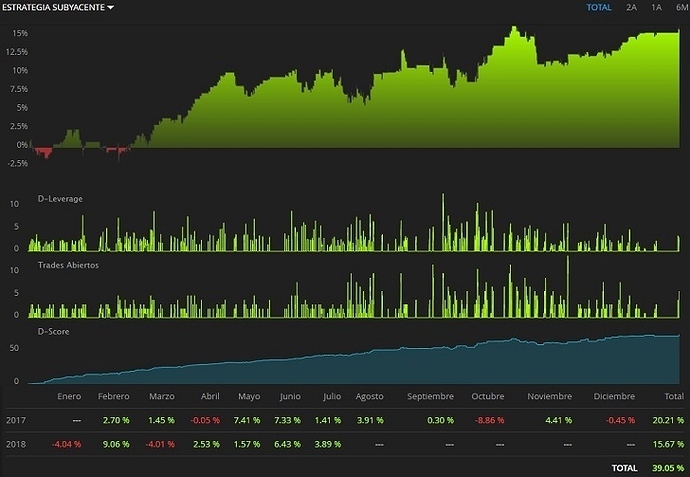 Continuity and mean reversion... ‘In my opinion there are only two types of reliable trading systems: Continuation of the trend and Mean reversion’ (Boris Schlossberg). Any loss implies that a recovery will have to be made to return to the original capital. The more losses it has, the greater difficulty achieving consistent results. Here we must take into account the fundamental correlation between the percentage of hits and the ratio of benefit / risk. The statistical data obtained with both parameters give the MATHEMATICAL HOPE which should always be positive. A high level of risk will lead to greater losses in the event of lossy trading sequences. As a general rule, this system contemplates a maximum level of DAILY RISK for total operations. It is placed around 0.5% of the trading account. The DAILY OBJECTIVE can vary and in each position it's done a positive or negative partial exit. The system also close each position at the moment the price is turned over. The first results of the day are taken into account. In the case of a net positive balance of around 0.5%, the platform is usually closed until the next day. SIZE is fixed for all operations and is calculated based on the risk of 0.3% per operation. There are not martingales. There will be times when the strategy is stopped while WAITING for a favourable situation to operate according to the established FILTERS. An attempt will be made NOT TO OVER OPERATE. ‘In trading one of the absolute best ways to avoid a losing spiral is to trade with no leverage at all. The other basic rule of the market is the rarer the trade, the better the trade.’ (Boris Schlossberg). 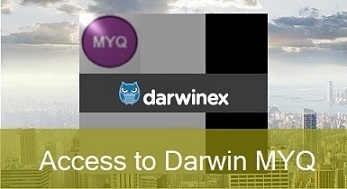 The Darwin MYQ became operational in February 2017. It has always operated with the FINDEX strategy, giving fundamental importance to the relative strength of currencies, and its evolution has been positive throughout the months. The D-Score, which measures the quality of the operation, has not stopped growing. Glad to be an early investor of your MYQ . I think people should frequent more this community and appreciate committed traders like you, instead of running after huge returns of unlikely migrations.